The advanced folding frame design and multi-seating positions of the XTERRA Fitness FB350 Folding Bike maximizes your use of space while providing a workout that is comfortable and effective. With folded dimensions of only 20.5” x 20” and built in transport wheels, it allows you to store it away when not in use and free up some valuable floor space. The padded lower back pad, large anatomically designed thick padded seat, and padded seat handles combine to give you a comfortable secondary seating position that will keep you working out longer. 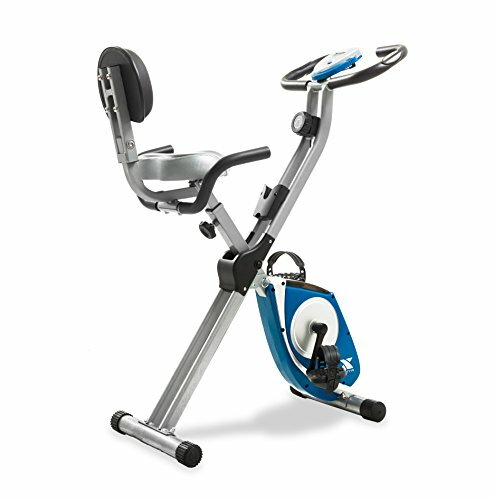 To ensure a smooth and sturdy workout, the FB350 utilizes our solid X-frame design with thick steel tubing and a silent belt drive system. Challenge yourself with 8 levels of resistance while you easily keep track of all of your workout data with the easy to use console. It provides feedback on your speed, distance, time, calories, and pulse along with a convenient scan feature. Make your workouts more effective by easily monitoring your heart rate with the handlebar mounted hand pulse sensors. For improved comfort and convenience, the FB350 features large multi-grip padded handlebars and an accessory holder for your remote control or phone. • Assembled weight: 42.3 lbs. If you have any questions about this product by XTERRA, contact us by completing and submitting the form below. If you are looking for a specif part number, please include it with your message.